I was very lucky to have my sister and 2 godsons come visit recently. And lucky for her, it was her birthday. Her only request was this cake. She had made it for Kees’ birthday and he declared it the best cake ever. When she told him it was my recipe and I made it even better, he was skeptical. So this was the test to see who made the best tres leche cake. After the first bite, mine was proclaimed the BEST cake. I don’t quite remember when I first had this cake, but I fell in love with it. Well, I fell in love with the first one I had and then started to use this recipe which was just as good. Almost every one I have had since has not been as good as this recipe. When I lived in Hawaii, this was the cake my and my sister’s co-workers wanted for parties. The problem is people think you can just pour a bunch of milk on any ol’ cake and it will work. It doesn’t. They also think you can just top it with anything and it will be fine. It won’t. Then they think they can “fancy” it up with lime or pineapple flavoring. You can’t. And when someone says, “a soggy cake? 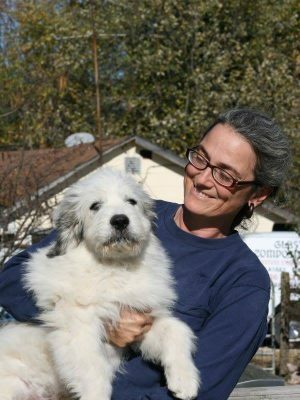 !” in disgust, tell them they are right and they should not eat ANY of it. Then have a second helping for yourself. makes one cake, approx. 8 servings. 1/4 Cup powdered sugar, adding 2 tbsp more at a time to your taste. Preheat oven to 350 F. Butter and flour bottom of a 9-inch springform pan or cut a sheet of parchment paper to fit. Beat 5 egg yolks with 3/4 cup of sugar until light in color and double in volume. Stir in 1/3 cup whole milk, 1 teaspoon vanilla, 1 cup flour, 1 1/2 teaspoon baking powder. In a small bowl beat 5 egg whites until they form soft peaks. Gradually add in remaining 1/4 cup sugar. Beat until stiff peaks form with shine, but not dry. 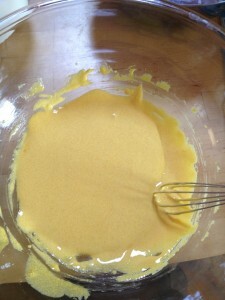 Fold 1/3 of the egg whites into egg yolk mixture until incorporated, then add the rest 1/3 at a time. Pour into prepared pan. 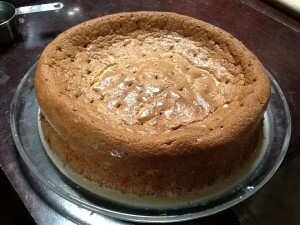 Bake for 45-50 minutes, or until cake tester inserted in the middle comes out clean. Cool 10 Minutes. 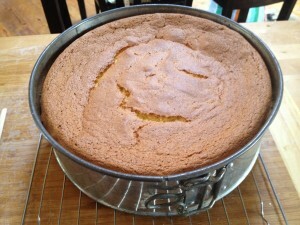 Loosen edge of cake with a knife before removing sides of the pan. Cool cake completely. Place cake on a deep serving plate. Using a two-prong meat fork, chop-stick, or anything that will make a similar size hole, pierce entire surface of the cake. Mix 1 can sweetened condensed milk, 1 can evaporated milk, 1/4 cup of heavy whipping cream, and 1 teaspoon vanilla extract. 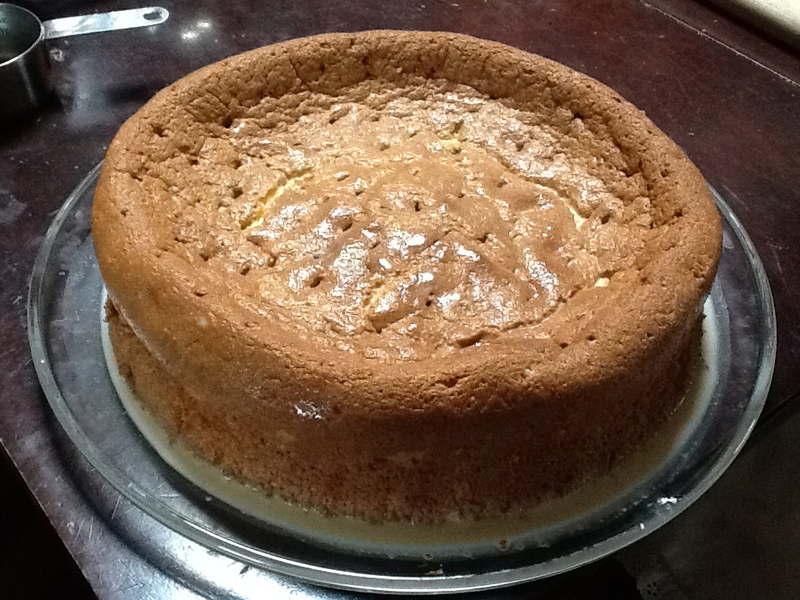 Measure 1 cup of the milk mixture, pour over the cake, and refrigerate for 1-2 hours. 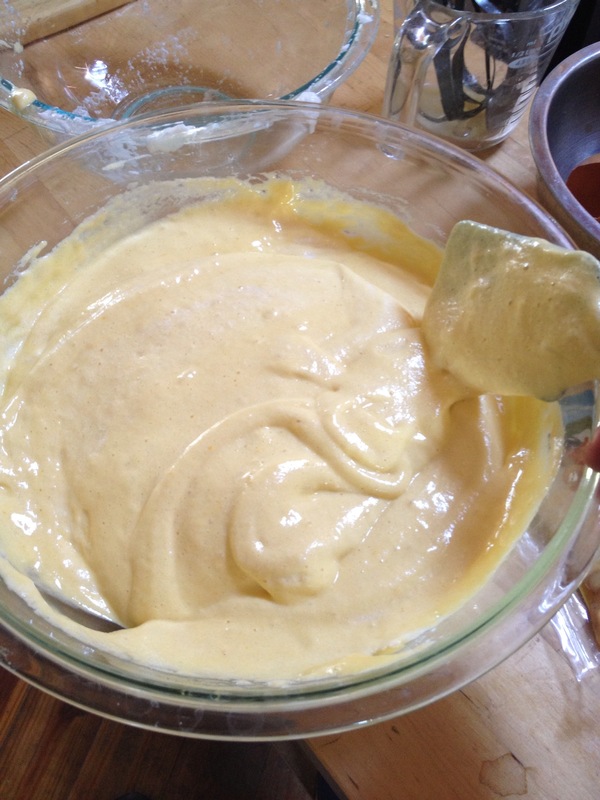 Pour remaining milk mixture over cake, and refrigerate another 2 hours, or overnight. Mix heavy whipping cream adding in the powdered sugar to your desired sweetness. 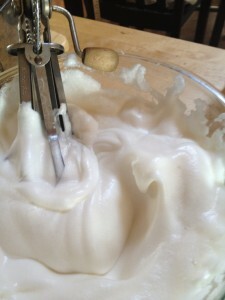 Whip mixture until it forms stiff peaks and is spreadable. 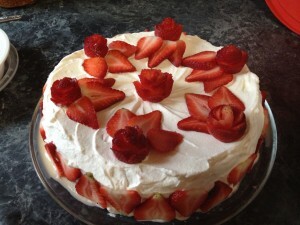 Frost cake with mixture and garnish with strawberries. Keep cake and leftovers refrigerated. Use glass or ceramic mixing bowls that are dry. 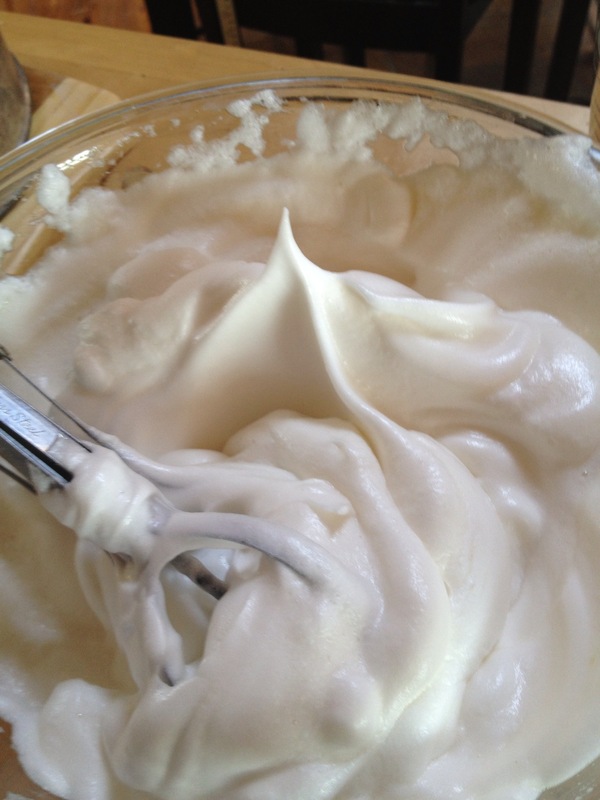 When beating egg whites, this helps them form better and stay light. I always use a springform pan, so I am not sure how a regular cake pan would work. You can substitute low-fat for the whole fat milk products, but they don’t really take that much fat out. I have never tried this, so I am not sure how it would change the results. You can use rum in the milk mixture instead of vanilla extract. The alcohol in the rum is not cooked out of the final product. Only use rum if it will be eaten by adults who drink. I have never been a huge fan of pecan pies. Always too sweet for me. And even before I became more concerned with my health, something about basically eating straight corn syrup just seemed wrong. So when everyone else called dibs on all the standard pies for Christmas one year, I decided to try this one. Now, I am a pecan pie addict! I used the maple syrup we made and substituted sorghum we bought locally for the molasses. And you MUST toast the pecans. It brings out the flavor so much more than just plain. Just be carefully and watch them. I set a timer for 5 minutes and keep resetting until they are done. It is VERY easy to go from toasted to burned. I speak from experience. Cook’s Illustrated has a great pie crust recipe I have in another post. However, if you don’t want to make your own, they recommend the Pillsbury refrigerated crust over the frozen. Heat syrup, sugar, cream and molasses in saucepan over medium heat, stirring occasionally, until sugar dissolves, about three minutes. 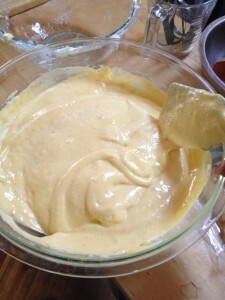 Whisk butter and salt into syrup mixture until combined. Whisk in egg yolks until incorporated. Scatter pecans in pie shell. Carefully pour filling over. Place pie in hot oven and immediately reduce oven temperature to 325 degrees. Bake until filling is set and center jiggles slightly when pie is gently shaken, 45 to 60 minutes. Cool pie on rack for 1 hour, then refrigerate until set, about three hours and up to one day. Bring to room temperature before serving.